Below, we’ll answer five critical braking system questions — and by the end of the page, you’ll understand exactly what’s happening in several scenarios where your brakes might be asking for some attention. When Is It Time to Change My Brakes? Your braking system has numerous components, but the brake pads and brake rotors are the stars of the show when it comes to getting your vehicle stationary. When you apply the brakes, hydraulic pressure squeezes the pads into the rotors, slowing the vehicle down with tremendous amounts of friction. The pads and rotors wear down slightly every time you press the brakes, eventually wearing to a point where they can no longer do their job. It’s a little like the rubber eraser on the back of a pencil, which wears out a little at a time until there’s almost nothing left. Many factors affect the rate at which things wear out. These include the vehicle, driver habits, types of use, for example, towing or other severe driving, terrain characteristics, and even owner maintenance habits. The quality of parts has a lot to do with their lifespan too, with cheaper components tending to wear out and require replacement more quickly. When do your brakes need to be changed? In simple terms, they should be changed when the thickness of the brake pads and/or rotors falls below a certain safe limit. As this limit approaches, stopping power may feel reduced, a loud squealing sound from the brakes may become irritating and constant, and visible wear to the brake rotor surface may be noted. A technician may also recommend replacing brakes after a system inspection, which drivers should have completed regularly for peace of mind. Finally, some vehicles are equipped with special sensors that detect brake wear and can alert the driver to have the system serviced. What Does It Mean When My Brakes Squeak? Brake pads are built with a special feature that’s automatically activated when they have worn out past their useful life. Simply, a metal tab or blade is attached to the brake pad, where it hovers just above the brake rotor. As the brake pads wear out (just like your pencil eraser), they get thinner, which brings the metal tab closer and closer to the metal brake rotor. At some point, the brake pad material will hit its minimum safe thickness. Here, the metal tab physically contacts the metal brake rotor, where it generates an irritating squealing sound. This is an audible signal from your brakes that it’s time to replace those worn out brake pads. Just remember that brakes sometimes squeal or squeak, but not as a result of component wear. In any case, drivers should have their brakes inspected to determine the root cause of any unexpected noise. Why Does My Brake Pedal Pulse? Sometimes, you’ll experience a dull, throbbing pulsation from the brake pedal when stopping. This can be described as a sort of ‘wobble’, which may be felt at the brake pedal, through the steering wheel, or through the entire vehicle. This form of pulsation is the telltale sign of disc distortion, which is sometimes referred to as brake rotor warpage. Here’s the ******** brake rotors are steel discs that need to be perfectly flat, like a vinyl record, to do their job smoothly. Sometimes, brake rotors become warped, losing their perfectly flat shape. 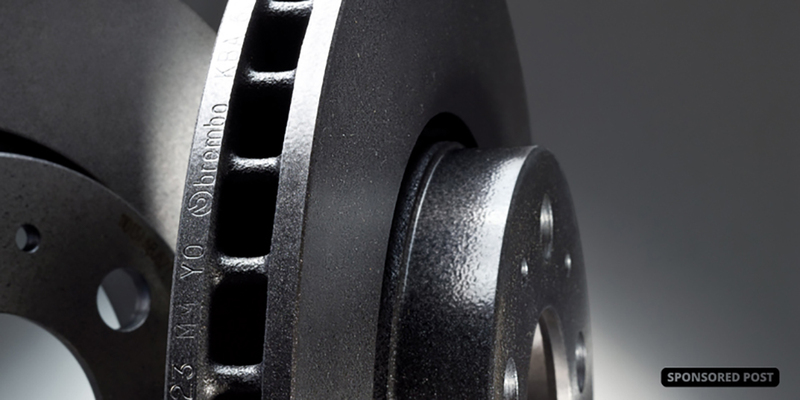 Much more commonly, the brake rotors wear unevenly, meaning the thickness of the rotor is uneven around the disc. In any case, dimensional variation of the brake rotor discs, whether caused by wear or heat, causes uneven braking output at the surface of the rotating disc, which results in a feel of pulsation and roughness when the brakes are applied. Rotor warpage is rarely an issue with high-quality brake rotors and is typically caused by a failure of low-quality rotors to hold their shape against the tremendous heat generated in the braking system during severe use. If you use low-quality brake rotors and use your braking system hard (perhaps on hilly terrain, or while towing, or while driving a vehicle fully loaded with passengers and gear), rotor warpage is nearly guaranteed. Should You Replace Your Brake Pads and Rotors at the Same Time? This is a common and highly-debated topic with drivers looking to save a buck or two. Your brake pads and rotors are partners. They work together every time you press the brake pedal. They’re best pals. But one of these two components may wear out before the other, leading many to wonder if they should replace both at once, or just what’s worn out. The generally-accepted principle of changing pads and rotors at the same time has several benefits. First, pads and rotors are designed to wear down together. Over time, small grooves will form in the brake rotor surface and corresponding brake pad. These grooves fit into each other, ensuring 100 percent of your brake pad is acting on 100 percent of the rotor, for 100 percent stopping power. Change the brake pads and not the rotors, and the grooves no longer line up. When choosing this route, 100 percent of your new brake pad may be acting on only 80 percent of the grooved brake rotor surface. Accordingly, braking power will be reduced. Also, the old grooved rotor surface will rapidly chew up your smooth new brake pads, wearing them rapidly. Finally, if your brake rotors wear out 4 months after the pads do, you’ll be making another visit to the shop to have them replaced, and you’ll be paying the labor rate a second time to change them. For instance, changing pads and rotors might take a technician one hour in total, but changing them separately means you’re paying the majority of that labor rate, twice. There are several reasons a vehicle’s brake pedal may go all the way to the floor, and all of them are serious and require immediate attention. Causes may include a leak in the hydraulic portion of the braking system, contamination of the brake fluid by air or water, or severely worn pads and rotors. If you experience a brake pedal that goes all the way to the floor, you’re best to stop driving as soon as possible and have a professional assess the vehicle. Respectfully, it is not "generally accepted" practice to replace the pads and rotors at the same time. The correct procedure is to resurface the rotors when pads are replaced. When surfacing the rotors will reduce them beyond their minimum allowable thickness, then they should be replaced with the pads. The minimum thickness is stamped into the rotor for the benefit of the machinist. The brakes on my 2014 M6 have squeaked loudly and constantly from Day 1. Dealer says that's just how it is. My experience is that brake squeal is frequently caused by the vibration of the brake pad against the piston surface pushing it against the moving brake rotor. The most effective way to eliminate this is to use Synthetic Disc Brake Caliper Lube, such as the Permatex product. I would check with a competent mechanic to learn if such a product would be recommended for your brake system.